A last run in the ocean did not get posted because the phone overheated and shut down our app. We can now monitor the phone temperature over the Internet. 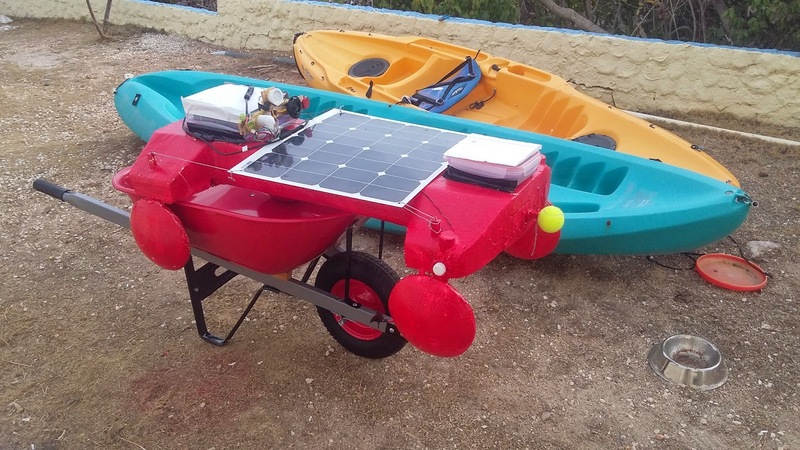 I wanted to see if we put the phone under the solar panel if the Compass, GPS, and Internet connection would all work ok.
We I put the Quadmaran-5 on a wheelbarrow so I could go up and down the street. This picture shows the phone in front of the solar panel for the control tests, it was later put under the solar panel. As I turned it turned motors on and off the right way just as quick, so the compass seems fine under the solar. The Internet status report still came in every 20 seconds, and the phone signal strength seems good. So Internet is ok with phone under solar. So it seems ok to put the phone under the solar panel..